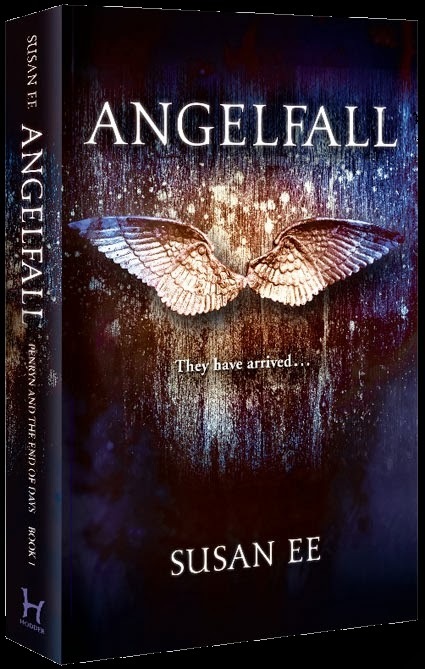 Angelfall is the first book in the Penryn & the End of Days series by Susan Ee. Penryn is pushing her sister Paige in her wheelchair, her unstable mother at her side, walking quickly down the deserted streets of a town in Silicon Valley, CA, in a dystopian world after the angels went to war with the humans and razed their cities. Then, an angel falls from the sky, five other angels on his heels. Penryn (named after an exit on Highway 80 — a fact that can give you a hint about her mentally ill mother) watches the battle, hiding behind a truck with her mother and sister. 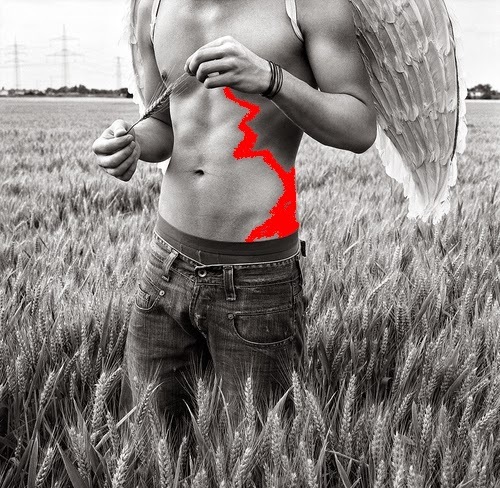 It is a bad thing if you attract the angels’ attention, and unintended they do! While the five angels overtake the one with the snowy white wings, little Paige is making a small, horrified sound, and one angel hears her. Penryn tries to distract the angels, but her little sister ends up being abducted by one of the angels while Penryn is left with a dying, wingless angel at her feet. A fragile alliance is created between Penryn, the human, and Raffe, the angel. She needs him to help her find her little sister; he needs her in order to find his way back to the angels’ compound, where he can make himself whole again. Thus begins Penryn’s journey to find her little sister in a world that was destroyed by these angels just six weeks before. Danger is everywhere. The angels are deadly and menacing — don’t get on their radar! There are human gangs roaming the streets, looking for anything they can get in order to survive. Food is scarce, and there are some creepy creatures — cannibals (?) — roaming the night. No place is safe. Why was Paige abducted by angels? What do they want with a child? Penryn is determined to find her sister; nothing can deter her from this goal. Her journey through the broken, harsh world parallels her character growth and her relations with her reluctant angel partner. Penryn Young is 17 when the story begins. A survivor and a fighter, she is resourceful and has a mind of her own. I like the fact that she was not some naive, innocent young girl before her world was destroyed. She had been hardened by life, her mentally ill mother, and her crippled sister. She had to fend for herself and her family in the “normal” world. She does not go blindly into dangerous situations — she weighs the options until she comes to the right conclusion. Penryn’s mother made her take a lot of self-defense courses after the disastrous day when Penryn and her father came home to find mother standing above little Paige, who was lying on the floor broken and crippled. No one knew what happened; her mother didn’t talk about it. Penryn is fiercely loyal to her family. She is stubborn and compassionate. She is not shy about speaking her mind; sometimes she can’t stop herself from opening her mouth when it might better to shut up. 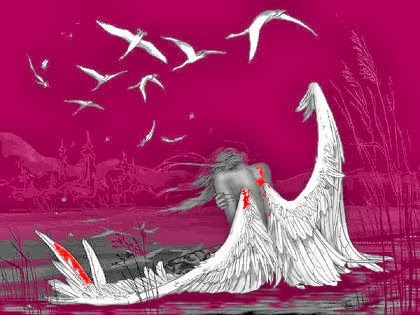 The sword-wielding, worrier angel is rescued from certain death by a mortal girl. Of course, he is proud, cocky, and arrogant, looking down at the “monkeys,” as humans are called by angels. Raffe doesn’t talk much and is very self-contained. He is earth-shatteringly gorgeous, has the body of an Olympic swimmer and all, like an angel should look. Raffe has some agenda that is not clear yet — he is high in the angels’ hierarchy and in the middle of a political angel power struggle. It looks like he doesn’t want any part of it. What made me smile is the fact that he is an agnostic angel, can you believe it? This is part of the uncommon angel lore in the story. What an oxymoron! Like Penryn, he goes through a journey of his own, slowly learning to respect Penryn, turning out to be a perfect ally in their quest. He runs his finger tips along my cheek, caressing my face. “Hush. I’m right here.” He looks at me with deep anguish in his eyes. Like there’s so much he wants to tell me but feels it’s too late now. I want to stroke his face and tell him that it will be okay. That everything will be all right. And I wish so badly that it would be. We now play a permanent game of I-am-crazier-and-scarier-than-you. And in that game, my mother is our secret weapon. Penryn’s mother is mentally disturbed, but I am sure we don’t know yet her full role in the story. There is more than meets the eye here. Why does she collect newspaper articles about mothers who killed their children? What is this strange language she sometimes babbles in? Is it related to the old myth of the Nephilim that Raffe tells Penryn about? “Penryn? Who are you talking to?” My mother sounds almost frantic now. Weak or not, we both know he could have killed me if that’s what he wanted. I won’t give him the satisfaction of knowing I was scared, though. I can tell by her fading voice as she says this that she’s reassured and walking away. There are some good side characters, like the leader of the human resistance, the albino angel, and the spymaster twins. There is not much written about them, but enough to get me curious. I find this story an original one. It starts as another angels/fallen angels story, but it moves to different, uncommon territories. You know there is danger from page one. It is fast paced and very well written, has a lot of dry humor, and the dialogues are great. The banter between Penryn and Raffe is funny and clever. “What if they don’t let us go through?” I ask, trying not to move my lips. “They will,” he answers from the dark recesses of the backseat footwell. “How do you know?” “Because you have the look they’re looking for.” “What look is that?” “Beautiful.” His voice is like a caress from the shadows. There are real-world possibilities here mixed with the fantasy. What will happen to our world, to us, if a disaster strikes? Can we face it? Are we, or at least some of us, strong enough? Penryn believes in the human race. Even in a desperate situation, she still has hope. I think Susan Ee wrote a compelling story, an intelligent plot with reliable characters. I wish she would elaborate more about the angels’ agenda and the war that destroyed the world, but maybe it will happen in the next book. Just a few words on the angels’ back story. Though the term “angel” comes from the Bible, these angels are not really Biblical. They have human reactions and political dynamics. Somehow they reminded me of the stories in Greek mythology, with the Olympic gods’ quarrels. I’ve known for a long time I wanted to write a novel about angels. They’re so fascinating. Classic angels are associated with destroying entire cities and turning people into pillars of salt. In Revelations, they are the harbingers, and quite likely the executioners, of doom. And yet they’re portrayed as cute little cherubs or beings who bend over backwards to make us happy. Like unicorns and vampires, they must have an amazing public relations department. So what if the PR fog cleared? What if angels were unleashed on the modern world? Would there be nothing but death and destruction? Or would there still be some room for dark adventure and romance? What would happen if one of these battle-hardened warriors had to partner up with an extraordinary victim of their apocalypse? I just had to find out. If you like a good, dark, entertaining read, this is the book for you! Just enjoy this fast ride. So, what do you think, dear Wenches? Would you dare read a book that is considered Young Adult? I have a hunch you won’t regret it, at least I hope that’s the case. Wow I want to read these! Loved your review Merit. The books sound really interesting. Like Shau, I'm tempted to read them. 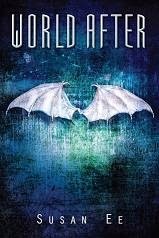 I have heard some excellent things about ANGELFALL, which I still need to read. Nice pick! It's a fantastic read, with an apocalyptic touch that is disturbing and gory; as it should be. The plot weaves through you with a fluidity I can't thoroughly explain. There is no way you won't be hooked by this author's way with words.